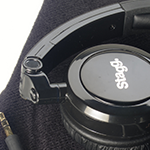 Selection of quality headphones from Samson, Stagg and others. Samson SR series headphones. AC-SHP-I500BKH Equipped with powerful 40mm neodynium magnets, these little headphones pack a huge sound! 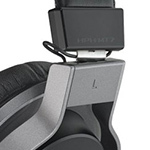 AC-HPHMT7RF Yamaha MT7 headphones are high-resolution monitor headphones that reproduce even the most subtle nuances of the source sound. In addition to mixing and recording in the studio, the HPH-MT7 headphones are perfect for mix monitoring in live performance applications.